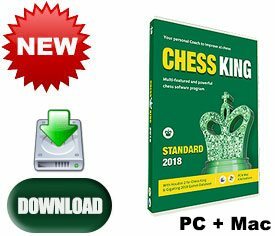 The new Chess King Standard 2018 is considerably improved from the original Chess King  of 2011 or the Chess King 2 from 2013. 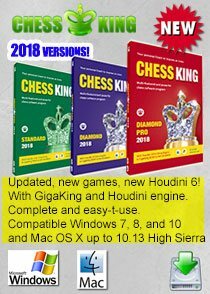 It's also improved from the 2015/2016/2017 versions of Chess King Standard as it now is compatible with up to both Windows 10 and Mac OS 10.13 High Sierra (or any previous Windows or Mac OS) and has an updated GigaKing with games till end of 2017. It’s the perfect tool for any chess player to improve at chess. 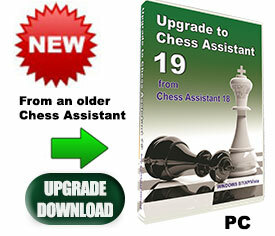 Provides a complete chess program at an unbelievable low price. 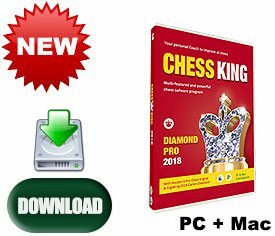 Chess King Standard with Houdini 2 for Chess King is the new improved version for 2018 of the top selling Chess King  and Chess King 2 chess software. It is sold with both Mac and PC installers and allows up to 4 activations in any mix PC & Mac, for example 3 PC installations and 1 Mac installation. 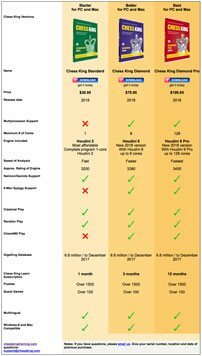 Chess King Standard includes Houdini 2 for Chess King grandmaster engine and the new updated 2018 GigaKing game database with over 6 million games, a database of commented games and the largest correspondence database, bringing the total of games included in Chess King Standard to 6.8 million games. 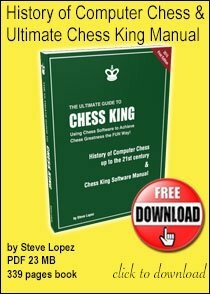 Chess King Standard includes the grandmaster Houdini 2 for Chess King, a chess engine with rating above 3000 ELO. 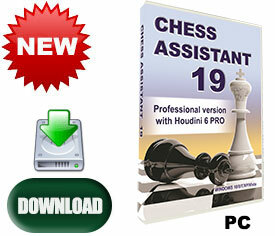 Houdini 2 for Chess King is 1 core engine specially developed to integrate well with Chess King. Since it uses only 1 core it is compatible with older systems with fewer cores. 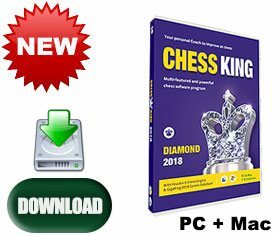 Both installers for PC and Mac are included in the Chess King Gold package. The PC version is compatible with all windows versions from XP, Vista, 7, 8 to the most recent Windows 10. The Mac version is compatible OS X 10.7 up to OS X 10.13 High Sierra (or previous). Internet connection required only for download of the program. Chess King Standard will help you improve at chess. It’s complete with all the best tools, and it’s easy to use for all levels. Play, learn, analyze, prepare for your opponent, store your own games and share them to the world. Chess King Standard is a new and versatile tool for chess players and is an ideal introduction for the beginner, a challenging opponent for the practiced amateur, and an invaluable coach for the aspiring master. Chess King Standard emphasizes simplicity of use in training players. However, it is more than just a traditional training program as it includes an extremely strong chess engine and a huge professional database. It is also a convenient tool for analyzing and studying one's opponent before facing them at a tournament. 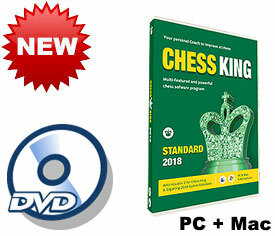 Buying Chess King Standard is like getting several products and paying only for one, a professional chess software playing and analysis system, the largest game database available GigaKing, the grandmaster chess engine Houdini 2 for Chess King, 1500 chess puzzles for all chess levels, a unique random playing mode, and much, much more. 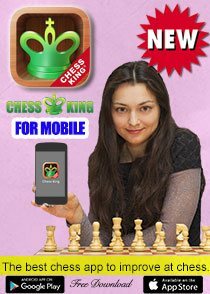 Included: Houdini 2 for Chess King, GigaKing Database of over 6 million games, Full opening tree, Chess puzzles, over one hundred opening positions, Photos of over 1600 chess players. 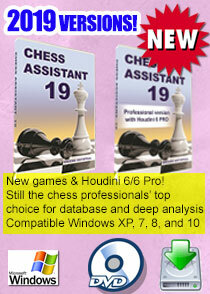 Houdini 2 for Chess King - a chess engine rated well above 3000 Elo is a good choice for analysis. Considering such a strong engine can be frustrating to play against, Houdini 2 for Chess King includes various kinds of handicaps that can be set up using the Chess King interface. The version of Houdini 2 for Chess King that comes with Chess King Standard is a single-processor one. It’s a great chess analysis system available today to everyone. The GigaKing database is updated up to the beginning of 2018 and includes a full opening tree. Full Chess960 support. The program is very easy to use, with several video tutorials available on the publisher's site and a possibility to send questions and feedback to the manufacturers. Get yourself Chess King Standard or surprise a loved one with the best chess gift of the year. You can play at any level you choose, from a rating of 800 to 3200, either with white or black, and either for fun (not counting for rating, you can take back moves), or in rated mode. Your games will automatically be saved in your games database and you will be able to analyze them in detail with the Grandmaster engine Houdini 2 for Chess King to see what mistakes have been made. The Random Mode is exclusive to Chess King, in which you can choose what advantage you want to start the game with and the number of pieces you want to have on the board. For example suppose you want to start with an advantage of +6 (the equivalent of 6 pawns advantage), Chess King will randomly select a starting position with the characteristics you decide and then you will play that position against Houdini 2 for Chess King at the highest level. Anybody should win with such a crushing starting advantage, but you’ll see it’s not that easy! You can set up any position you like and then analyze it or even play it. However, Chess King Standard, since it contains Houdini 2, does not know the complex Chess960 castling rules and so cannot play this particular random game. If you’d like to play Chess960, it is recommended to get Silver or Gold Chess King. Look out for games of your favorite players in the GigaKing database. For example a search for Magnus Carlsen will give more than 2,000 games including all the games he played in official tournaments and many of his published exhibition matches and simultaneous exhibitions. You will learn with the puzzle mode, with hundreds of exercises from beginner level until Grandmaster level. Chess King Standard will congratulate you for your success and tell you where you went wrong. In the Analysis Pane after the opening stage one sees the game notation and comments, the whole game evaluation graph and below the best lines calculated by the engine Houdini 2 for Chess King. In this position below black could have taken the advantage by taking the pawn on e5, giving an evaluation of -0.86 (Black would have an advantage of close to 1 pawn equivalent), and instead played a bad move a4, which gave an evaluation of +0.49, which means white is up the equivalent of 1/2 pawn. With Chess King Standard you will know the best moves in each position. 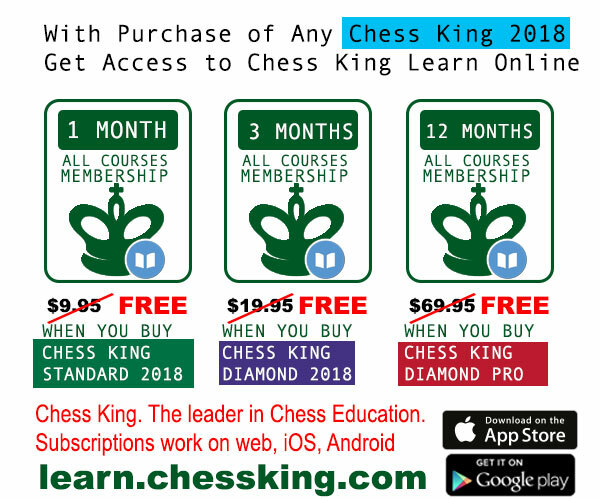 When you buy the new Chess King Standard 2018 version, you get 1 month free access to dozens of high quality online chess courses at learn.chessking.com as well as all those courses in either iOS or Android Apps on your iPhone/iPad/phone or tablet. 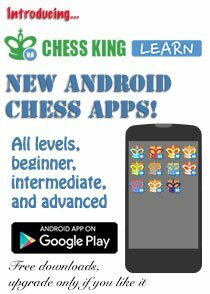 That's an enormous amount of chess educational material at your fingertips during the free subscription period.